A game which has been puzzling Stadium 64 for some years now, and we’ve been asked to put an entry on the site in the hope of solving this long mystery. It has a game which has been searched for online and via auction sites, to no avail. 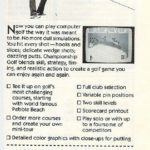 Championship Golf and Pebbles Beach was a mail-order only title that was advertised in American magazines during 1986, showing a C64 screenshot of a golf game, which to be honest doesn’t look too great. 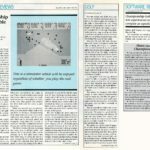 The game was even reviewed in Commodore MicroComputers magazine back in September/October 1986 and details that there was a manual that was 22 pages – suggesting there was a physical product available. 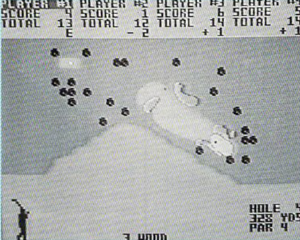 Things get interesting thanks to Martin/Stadium64’s hard research, where Gamestar released a golf game for the PC, Tandy, Apple II and Amiga called – “Championship Golf – The Great Courses of the World, Volume One: Pebbles Beach”. 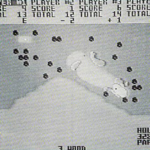 An almost identical game name, released the same year – but actually a very different game indeed! The C64 entry in Gamebase is thought to be an error, and is not a C64 version of Gamestar’s released game. Nothing unusual in a name being similar, but then Martin reveals that both Gamestar and Sportsware were only 30 minutes apart from each other – being both based in San Jose, California. Then when you look at the loading picture for Star Rank Boxing, you’ll see the copyright tag “Sporrtsware Productions Inc”. A further twist is that the “Orr” part could refer to a hidden credit to artist “Scott Orr”. So what happened? There are a number of possibilities. The most likely is that Gamestar took over Sportsware or incorporated them as some kind of development team. It could be that Sportsware had other titles planned, maybe Star Rank Boxing was another title in development which Gamestar obtained – and which explains the Sportsware credit. The key thing is that Gamestar obtained the right in some way to use the name, but due to the C64 game looking very dated – they had the game redesigned and revamped for release. It doesn’t explain the lack of a C64 version, but they probably decided against releasing the Sportsware game themselves, due to its dated look – but for some reason didn’t get a new version of the new design developed to replace it, which seems odd. We have added some basic credits for now, and hope that someone may come forward to clarify what happened. 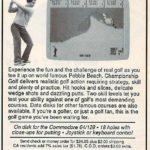 But it seems possible that a few copies of the Sportsware original game could have sneaked out during its advertising period, so can it be found at all? Yet another journey begins!